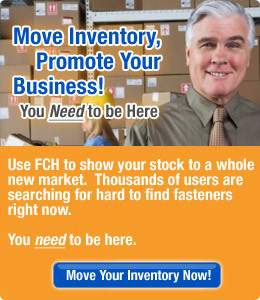 "Fasteners Clearing House [FCH] has worked well for us both on the sale side and in finding hard to find parts as well. We get inquiries at least once a week from there if not more often and several have turned into sales over the years. " Search thousands of Anchors in the FCH database of surplus, odd lot, slow-moving and hard to find fasteners. Click one of the links below to find everything from Concrete/Masonry Screw Anchor (Tapcon, Titen etc.) to Zinc Alloy Hammer Drive Anchor (Zamac Nail-In) from hundreds of fastener distributors. One-Step, Self-drilling Hollow Wall Anchors, E-Z etc. Many FCH Network Member companies sell their Anchors directly to end users, and others sell only to other distributors. Some list pricing information and some do not. The database is open for search by anyone with an internet connection, however members who login to the website receive additional benefits and more extensive fastener listings.